On behalf of its 1600+ members, the New Jersey Psychological Association (NJPA) wishes to state that we stand firmly with the American Psychological Association (APA) and with all those who, without reservation, have condemned the acts of hatred and bigotry that took place in Charlottesville, as well as all other acts of violence that have been rooted in hatred of other persons based on their age, gender, gender identity, race, ethnicity, culture, national origin, religion, sexual orientation, disability, language, and socio-economic status. Hate crimes are a public mental health issue. The American Psychological Association (The Psychology of Hate Crimes at APA Public Interest Government Relations Office, 2017) has disseminated research that indicates that people victimized by violent hate crimes are more likely to experience more psychological distress than victims of other violent crimes. Victims of crimes that are bias-motivated are more likely to experience post-traumatic stress, safety concerns, depression, anxiety, and anger than victims of crimes that are not motivated by bias. Hate crimes send messages to members of the victim’s group that they are unwelcome and unsafe in the community, victimizing the entire group and decreasing feelings of safety and security. Furthermore, witnessing discrimination against one’s own group can lead to psychological distress and lower self-esteem. The citizens of New Jersey hold tremendous pride in being one of the most culturally diverse states in our country. Yet, even when such heinous acts occur across state lines or among communities that one does not reside in, reading about them or seeing news reports, at minimum, can evoke strong visceral reactions in many within our society and, with some, can have a harmful effect on our emotional and physical well-being, particularly on members of marginalized groups. Of further concern, is the new research on the intergenerational transmission of trauma. There is no place in a civilized society for beliefs advocating for white supremacist views or the aims of neo-nazism. In our work we, as psychologists, are committed to assisting the people of New Jersey in dealing with the disturbing stress related to acts of both domestic and foreign terrorism and to furthering the mental health of all people who possess wide-ranging views of our society. Psychologists are extensively trained in helping those from all walks of life and aim to not only provide assistance when crises emerge, but equally important, we are in a unique position to assist individuals and communities through education and the delivery of psychological care to prevent future tragedies from occurring. We have compiled a list of resources which contain helpful information in addressing a variety of ways to address many issues related to these events. Click here to view this list. NJPA is an organization committed to providing mental health services for all New Jersey residents, and we remain steadfast in our nonpartisan mission. United in the principles of caring and respect, we stand together as we strive to serve New Jersey. Should you, or anyone you know, wish to receive more information on how to obtain mental health services, kindly contact us at 973-243-9800 or visit our Find a Psychologist page found above in our main menu. We will be happy to assist you. 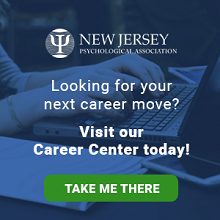 “The mission of the New Jersey Psychological Association is the advancement of psychology as a science, as a profession, and as a means of promoting health and human welfare in an atmosphere that supports the diversity of its members and the society at large."